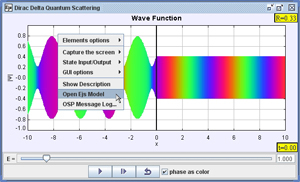 Right-clicking within an Ejs model, such as Dirac Delta Scattering, allows a user to examine the model contained in the jar file. A teacher prepares a simulation with a simple model of a phenomenon studied in the classroom and distributes it to students. Students run the simulation and work with it as instructed in the simulation narrative or exercise assignment. Students right-click on the simulation to gain access to the simulation code and study it using EJS. Students modify the simulation to change or extend the model or the view of the simulation, according to a modeling exercise prescribed by the teacher. Students package and send the modified simulation back to the teacher for correction.